This has to be one of my favourite wok dishes. Don't be tempted to add too many vegetables to it. 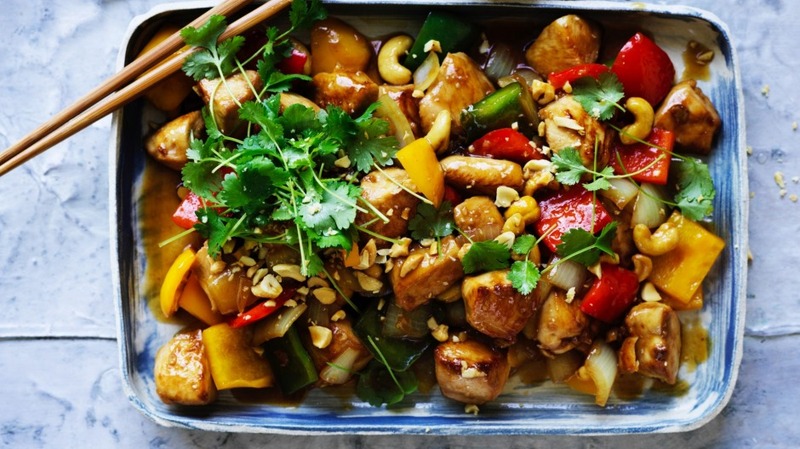 The contrast between the capsicum, nuts and chicken is all-important. If you want different vegetables, just make another stir-fry! 1. Combine the sauce ingredients and set aside. Combine the chicken with soy sauce and 1 tsp of the cornflour. Heat the wok over high heat and add 2 tbsp of the oil around its edge, letting it run down into the centre of the wok. Add chicken and cook, tossing the wok occasionally until the chicken is browned and just cooked through, about 3 minutes. Remove the chicken from the wok and set aside. 2. Return the wok to a high heat and add the remaining 1 tbsp of oil. Add the onion and garlic, tossing until the garlic starts to brown. Add the capsicum and continue to toss in the wok until the pieces begin to soften. Add the sauce ingredients and bring to a simmer. Add the chicken and cashews and toss. 3. Combine the remaining 1 tsp cornflour with 2 tbsp of cold water and drizzle mixture into the wok slowly , shaking or stirring the wok until the contents thicken to a silky consistency. Remove from the wok and serve. Serve with steamed rice and bok choy with garlic sauce.